Since the very inception of the Toyota Camry it has won over the hearts and souls of consumers globally from a penchant for reliability, fuel efficiency and dependable character traits. Manifested from the Japanese word “kanmuri” which translate to “crown,” company executives always felt something special with the four-door, midsize sedan. Representing as America’s best selling vehicle for the last 15 years, expect nothing short of nobility for the 2018 Toyota Camry. Now in its 8th generation, the Camry gasoline versions are on sale as the L, LE, XLE, SE and XSE while the Hybrid is offered in LE, SE and XLE. Amazingly, the Hybrid and its 208-horsepower Hybrid System Net Power was a joy to drive during my evaluation in the adventurous state of Oregon. But more importantly, the Ultra Low Emissions Vehicle II has an EPA-estimated 52 MPG combined (LE model). The Hybrid is expected to comprise 5% of 2018 model year sales mix. Typically, when something isn’t broke then there is no need to fix it. Though Toyota doesn’t have a problem marketing or selling the Camry brand, we live in a digital age where customers are smarter, savvier and technologically hungrier. So it was no surprise that the styling for Toyota’s field general was revolutionized with a “tech edgy” theme, sporty attributes and aggressive componentry. Think of what Nissan did with the Maxima a few years back. 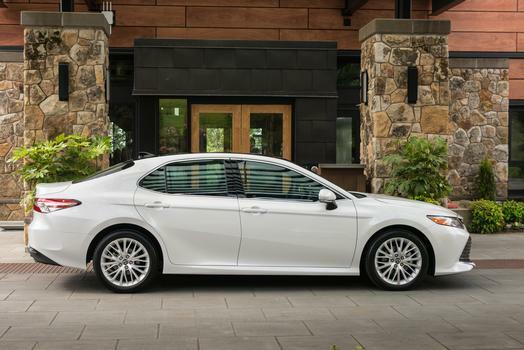 No longer will you look upon a Camry as mundane and boring. Especially if you focus on the sportier SE and XSE models as I did. Overall, its stance is wider and height has been reduced by 1” for a lower center of gravity. The vehicle features a snarling two-piece grille that flows into a lowered aluminum hood for a stronger profile. There were two XSEs I tested from each engine type starting with the all-new 2.5-liter Dynamic Force 4-cylinder with Dual Injection and 208-horsepower and 186 lb.-ft. of torque. Expect 39 highway MPG for extended summer road trips. The revised 3.5-liter V6 D-4S Dual Injection engine produces 301-horsepower and 267 lb.-ft. of torque at 4,700 rpm and gets you about 32 highway MPG. Both are paired with the new Direct Shift 8-speed automatic transmission that allows for sequential shift patterns. On the road the V6 really moves, especially in Sport mode using the paddle shifters. I was able to quickly accelerate up to 80 mph in 3rd gear. But keep in mind the V6 Camry will only account for 6% of the sales mix. 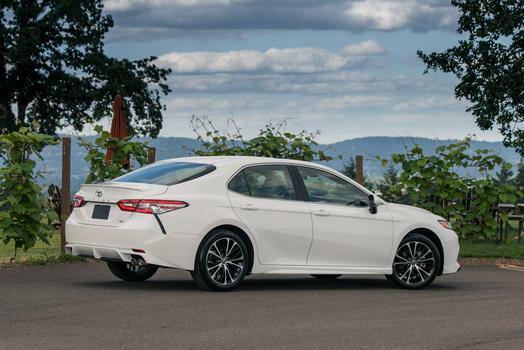 Although the Camry is blessed with a new chassis do not expect an adaptive suspension. My first vehicle chosen for the morning segment of the drive route was an XSE with a Blue Streak Metallic exterior and an Ash Leather interior. Aesthetically, it was definitely electrifying and emotionally drew me in which is almost an oxymoron for Camry. Its chiseled physique is adorned with dual pipes with quad chrome exhaust tips, 19” two-toned black alloy rims wrapped in 235/40 R19 Michelin rubber, a rear spoiler, a minimized front chin spoiler, panoramic sunroof and LED lights. Speaking of two-tones, the Midnight Black Metallic roof option is pretty sinister and can be matched with Blue Streak Metallic, Celestial Silver or Wind Chill Pearl hues. “With an exhilarating design, refined interior, stirring driving performance, cutting-edge safety and technology, and class-leading fuel efficiency, the all-new Camry retains its excellent value while raising its level of fun and excitement to new heights,” said Bill Fay, Toyota senior vice president of automotive operations. In typical fashion preventative safety measures in the form of Toyota Safety Sense P (TSS-P) are standard and add a quality peace of mind knowing your Camry will do all it can to reduce injury or harm on the road. The suite of active safety systems includes Pre-Collision System with Pedestrian Detection, Lane Departure Alert with Steering Assist, Automatic High Beams and Dynamic Radar Cruise Control. Then there is the Star Safety System providing Enhanced Vehicle Stability Control, Traction Control, Brake Assist and Smart Stop Technology. Wait, there’s more. Your new Camry also includes 10 airbags, Blind Spot Monitor with Rear Cross Traffic Alert and Intelligent Clearance Sonar with Rear Cross Traffic Braking. Inside, the 2018 Camry incorporates enough technology and connectivity to keep everyone from becoming restless. For starters, the rocking 9-speaker, 800-watt JBL sound system with Clari-Fi Music Restoration Technology to improve sound quality from compressed audio is certainly a gem. Additionally, with the largest subwoofer (10.1”) in a Toyota and horn tweeters in the A-pillars to funnel your music outward starting at ear level expect an improved listening experience during commutes. Additional assets include a 10” color Head-up Display, 8” Infotainment screen, dual front USB ports, Qi wireless charging, a backup camera, dual-zone automatic climate control and Toyota Entune 3.0. Sadly, but due to data protection concerns Toyota does not use third parties such as Apple CarPlay or Android Auto for its music and Apps. On sale this summer MSRP for the top-of-the-line XSE V6 is $34,950 and $29,000 for the XSE 4-cylinder. However, you can easily lower your expectations and hop in a $23,495 L grade 4-cylinder. The Hybrid goes between $27,800 and $32,250. Either or expect consistent quality throughout the lineup.